Earn up to 1,870 reward points. Experience improved wireless reception with the UA874. 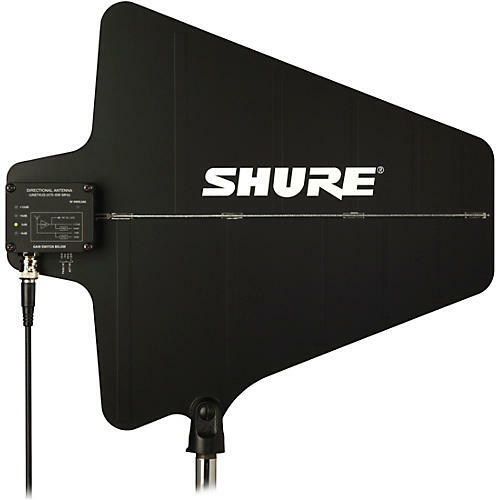 This UHF antenna uses a log periodic dipole array to produce a cardioid pattern toward the desired coverage area, achieving greater rejection of RF signals outside the area than standard ½ wave omnidirectional antennas. An integrated amplifier with four gain settings compensates for varying degrees of coaxial cable signal loss. The UA874 can be stand-mounted, suspended from the ceiling, or wall-mounted using the included swivel adapter bracket. Instantly improve your wireless signal!